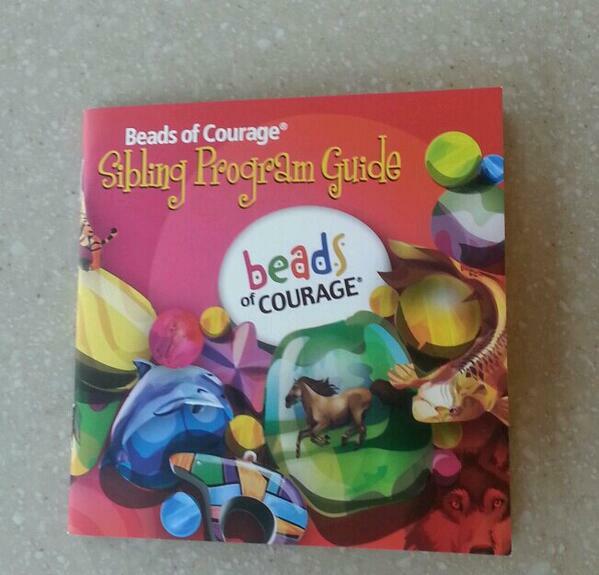 What a great surprise to find that someone knows about Beads of Courage! For those of you who have never heard of them, I would love to share my story. Maybe someone will be inspired to give $25 to Beads of Courage– so that a child who is very ill will feel like I did when I received mine. Just as I was beginning to sense the “chemo” feeling once again, luckily, I had another distraction. Robyn entered with a large plastic box and a paper cup. I was curious and intrigued as she plunked down table side, right next to me. Printed on the box, in huge, colorful letters, was Beads of Courage. Her short hair bobbed up and down excitedly, as she told me all about it. The Beads are for cancer kids to create a necklace by stringing together different colored beads that represent pokes, operations, ER trips, etc. She placed a long string in the paper cup, and then I began to make my selections. Slowly reaching for the bright green beads, I dropped them, one by one, into my cup– they were for tests. Next, I received white beads for days of chemo and yellow ones for days in the hospital. I added the pretty dark blue beads, as they too joined the others. They were for clinic visits. Lastly, I acquired an orange bead for my PICC line, four tan ones for my biopsies and bone marrow aspiration, and black beads for pokes. As black began to drown out the other colors in the pile, I realized just how much of a pin cushion I had become. I already had quite a collection and began carefully threading them onto my big long string. Reaching for the letter beads, I spelled out my name before looping and adding the rest. Wow. It was already nearly half full, and I then knew why Robyn had given me such a long string. My necklace is a symbol of what I had done and what I would do. I felt proud as it rested around my neck, each one of those beads telling a different story, a separate struggle and an eventual triumph. It might be just a little necklace, but it means something so much deeper to me.